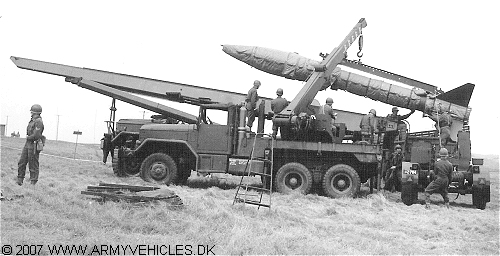 Danish Army Specific: Delivered as part of the "Honest John" rocket system. Historical: The medium wrecker M62 was build on the M40C chassis by International Harvester and Diamond T. It was intended as a replacement for the WW II Diamond T 969 and Ward La France M1/M1A1 wreckers. The crane used was produced by Austin Western and had a maximum lift capacity of 9 tons (20.000 lb.). It was hydraulically operated with the pump driven by a power take off from the trucks engine. A total of six prototypes were delivered by different firms. Among them Ernest Holmes (XM62E4) with a bed very like the WW II Diamond T 969, and Gar Wood (XM62E1) with a wrecker looking much like the M1A1 wrecker. The prototypes were tested at Aberdeen Proving Ground from 14 February to 28 May 1952. Due to licensing conflicts about the Austin Western bed the production period was relatively short. This resulted in the adoption of the M543 wrecker equipped with a later designed Gar Wood wrecker bed. In the Honest John launcher system it´s primary task was in conjunction with assembling and loading the rocket from the M55 truck to the launcher. Secondary task was to act as a recovery vehicle. Length: 7.87 m (310 inches). Width: 2.46 m (97 inches). Height: 2.59 m (102 inches). Weight: 20.200 kg (44.440 lb.). Engine: 6-cylinder (Continental R6602), 9.870 cm3 (602 cubic inches) displacement, liquid cooled. Range: 342 km (214 miles). Additional: 10 tons winch capacity. 20 tons capacity drag winch at rear.